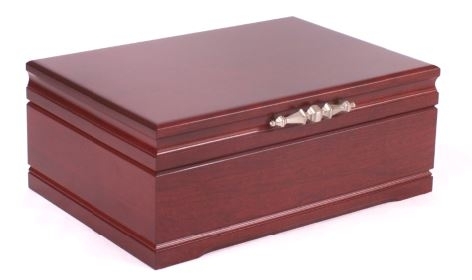 When you open this jewelry chest, you'll immediately smell solid American cherry hardwood in a Mahogany finish. The double swing out bars in the lid provide easy access to necklaces or chains. 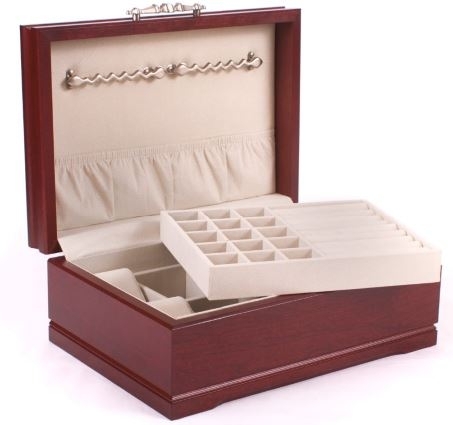 Hardware is brushed nickel and the lift-out tray features ring rolls and earring compartments. Two watch or bracelet pillows complete the top. Lift out tray reveals multiple large compartments. Made in the USA.